Providing food is the surest way to attract birds, butterflies and other animals to your backyard nature habitat. I like the challenge of managing my small backyard habitat. I choose plants, try them out and replace them if they aren’t popular with the animals I want to attract. In choosing what to put in your backyard, there are a few key points to remember. Start with who is in your neighborhood. What butterflies do you see in the area? What small mammals? Are there squirrels, opossum and chipmunks? Bees, hummingbirds and other pollinators? Get to know your local animals and provide what they need. Read field guides to learn their requirements for life. squirrel acrobatics? Are you fascinated by beetles and other insects? Do you like observing just about any animal or plant? This will give you a topic to focus on and learn about. For example, learn about butterfly life cycles to do things to attract them. Provide for every level of your backyard habitat. From insects and birds to reptiles and mammals, by providing for many different species, you’ll attract a greater variety of animals. Your ecosystem will be healthier too. So, provide for both young animals and adults. Plan your habitat from the ground up. Healthy soil supports invertebrates like earthworms and beetle larvae. These animals provide something to eat for snakes, other reptiles and amphibians. This may require stopping the use of pesticides, herbicides and insecticides in your garden. And birds eating insecticide covered insects can’t be good. Remember Robins eat earthworms. 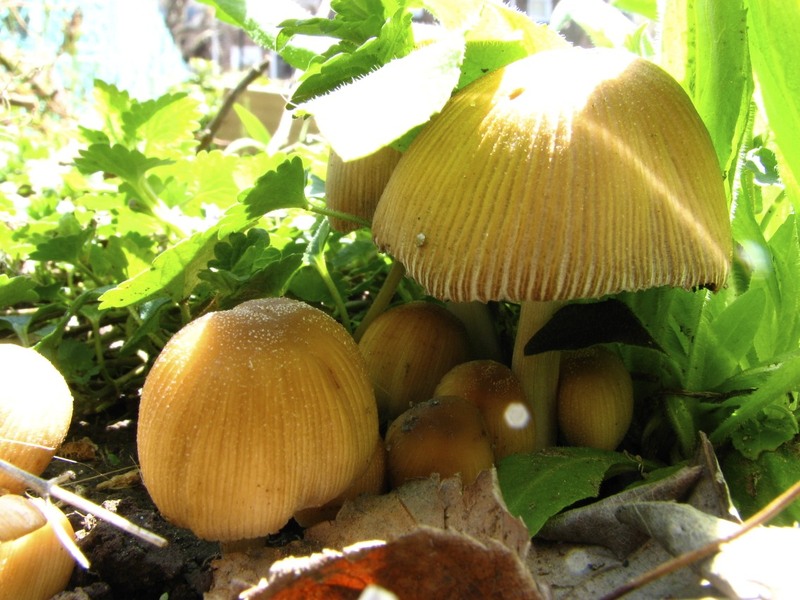 Mushrooms growing in leaf litter in my garden. Photo by Donna L. Long. The leaf litter, the layer of fallen leaves and old plant stems, supports the invertebrates and insects, that birds of the Thrush Family eat. Robins and Mockingbirds can often be seen scratching through the underbrush. So, not raking up all the leaves in a yard will support the life that depends on the leaf litter environment. food for insects. Insect attracting plants like goldenrod, milkweed, sedum and asters are sure to attract beetles, flies and bugs of all sorts. And birds will come to feed on the insects. Most songbirds feed their young almost exclusively on insects. milkweed and violets. Butterfly host plants are where butterflies lay their eggs. These plants provide food for the very hungry caterpillars after they hatch. 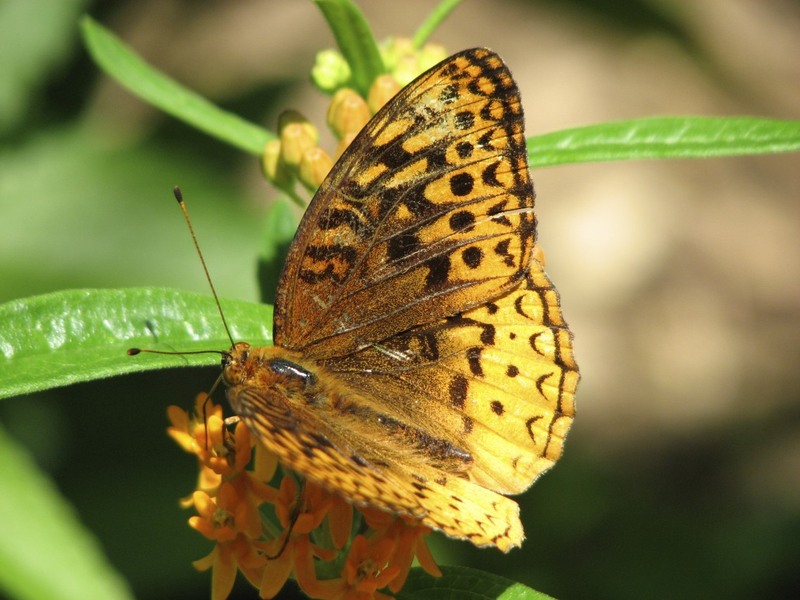 Each butterfly species has their preferred host plants. Monarchs prefer milkweeds. Many of the butterfly larva host and nectar plants are beautiful garden flowers. and native rose hips for fruit-eating birds in the thicket at the end of the garden. 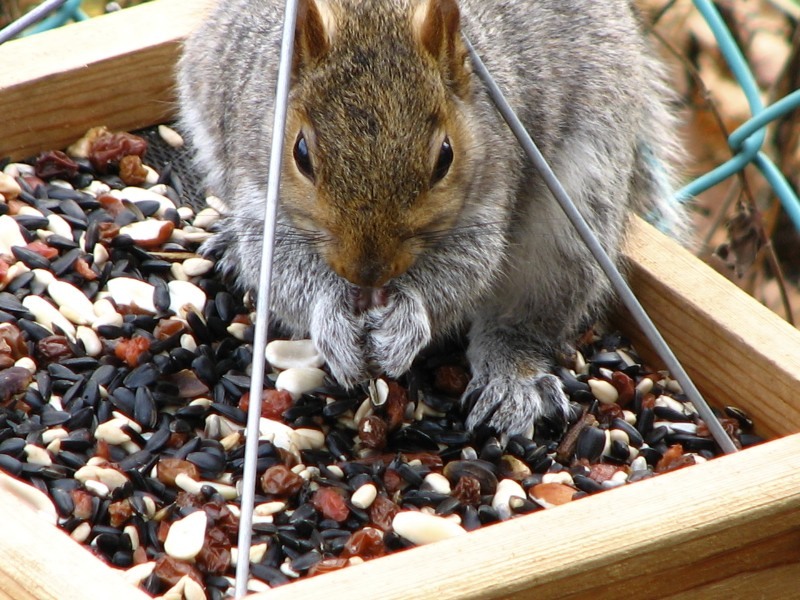 I also have several feeders for birds and squirrels. raise young for an assortment of woodpeckers, chickadees and squirrels. So, from ground level to high above, a backyard habitat can food good things to eat for many different species. 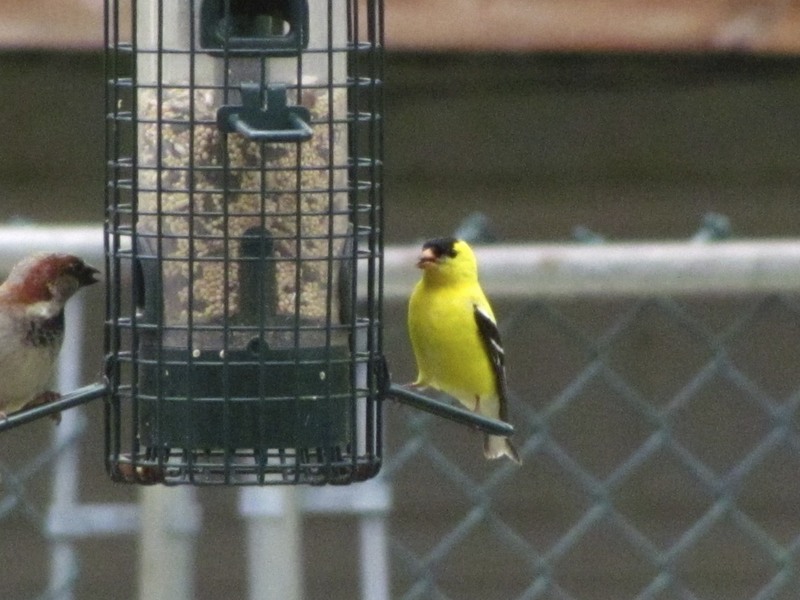 A male American Goldfinch and a male House Sparrow eat from the feeders in my garden. Photo by Donna L. Long. By providing something to eat during all seasons, you can attract animals to your yard all year around. For birds provide feeders in winter and a mixture of plants that provide food throughout the year. Many birds and some butterflies migrate long distances. Monarch butterflies use late summer and fall blooming nectar plants to provide fuel for the long journey to Central America. Migratory birds fill up on high-energy fatty fruits for their journey south. There are roughly thirty birds that stay all winter in the north. They eat dried seeds, fruit, insect eggs and hibernating insects. Trees and shrubs that hold their fruit throughout winter provide much needed food. Not removing leaf litter, dead logs and branches in autumn, gives insects a place to lay eggs and hibernate. And birds a place to find and eat them. up for long winter sleeps. Keeping feeders filled and planting plants that provide something to eat all year, will help make your habitat a center of activity. Native plants are the best plants to attract native animals. Animals recognize their food and other useful plants. The animals and plants have lived together for millennium. They have developed mutual dependence and relationships. Invasive alien species hurt our natural ecosystems. And native insects often will not eat alien species. If there the native food is not there the insects disappear. Then the birds, frogs and other animals that depend on them disappear, too. Make a list of the animals that you see where you live. Choose what species you want to attract. Read field guides on the needs of those species. is missing and what can you provide right now. will attract them to your yard. This is all very good advice! Managing a natural area to provide habitat can be a lot of work, but it is SO worth all the effort. I enjoyed reading your “how to” steps and reasons why decisions like leaving leaf-litter are so important. I am in the next stage of invasive plant removal on our wetland nature habitat. Last year the focus was on Himalayan Blackberry removal. This spring, I am removing Reed Canary Grass/ Nightshade. In the process I’ve already discovered a sizable Skunk Cabbage patch, and an area where spike rushes will likely take hold as the invasive grass is removed. Our Clean Water Services utility supplies 20 native Oregon plants/year to landowners that live within 100 feet of a riparian zone. The plants they gave us will be planted in the cleared property! 🙂 I’ll have a blog entry up soon to share some before and after photos. Thanks for the comment. I am looking forward to your update. No, I have never been to the west coast but would love to see the redwood forests. Abington is not far from my favorite place in Philly, Wissahickon Valley Forest and the Schuylkill Environmental Center. Thank you for following my blog… it will be fun to be an East-West Coast connection. Your posts often bring me “home”.. after growing up in Abington, I can still recall many of the places you mention! Have you been to the West Coast?